I can’t take credit for coming up with this idea, in fact I saw it on Pinterest and thought “oh how cool, I want to make one”. So I went to Goodwill to buy the frame and stopped by Home Depot to buy the radiator sheet. Bang down or if you can, remove the tabs that hold the frame backing on. If you don’t remove them, lift them up so you can put the radiator sheet in easier. Measure and cut the radiator sheet so that it fit inside the frame. I put something heavy on top of the radiator cover once I glued it so it would stay put. Once dry, find the perfect spot on your wall and hammer in some nails. It’s that easy. 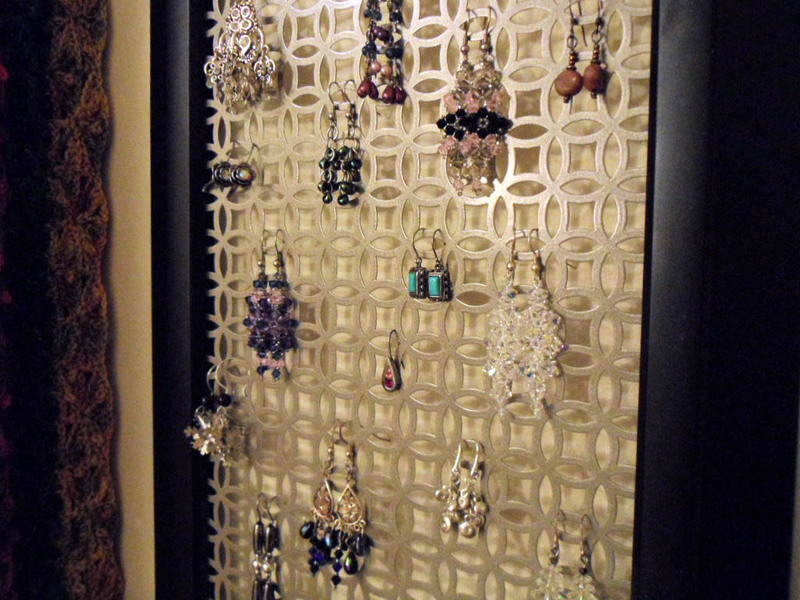 It’s so nice to see my earrings hanging up instead of rummaging through my jewelry armoire to find them. Plus, I forgot I even had some of these! What’s a radiator sheet? This is so cool. I just went to the website and typed in radiator cover and this came up. But in the store they have smaller sheets and more of a selection that what I found online. At my store it was a stand at the end of an aisle near the lumber area. I’m not sure if they are all set up the same, but I’m sure if you ask someone they can help you. OK, that sounds good. Did you go to Home Depot or a different store? I went to Home Depot, but I’m sure a Lowe’s would have them or another hardware store. Let me know if you have questions when you make yours. You’ll have to share it with me so I can see it! It’s so easy and would make great holiday gifts! You’ll have to share a picture of it when you are done. I am so excited about this project that I had to share it. I’m going to work on one for me this weekend. The more you make jewelry, the more you need places to store it safely. This will be PERFECT! Thanks Tracy! Thanks for the reblog. I had no idea this would be so popular, but I’m happy it is.